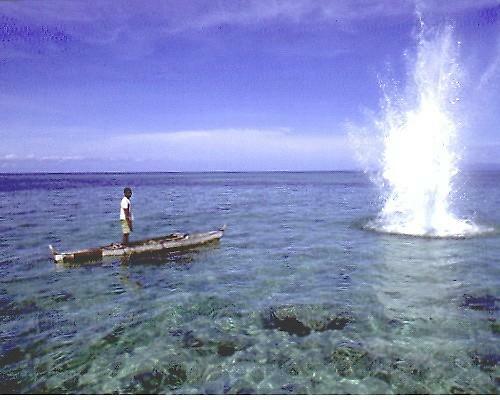 Jokes about fishing with dynamite have been around as long as there has been fishing and dynamite. We laugh at the joke and then try to catch fish the old-fashioned way: with a rod and reel. Who knew not everyone was joking? A boy was fishing with his father on the bank of a river in Bassendean's Pickering Park in Perth, Australia, earlier this month when the kid made a startling catch, according to a Tuesday report from InMyCommunity.com.au. At the end of his line was a white tube marked "explosive." The report said that police were called to the scene and seized the object before notifying the bomb squad. Quite frankly, I believe I would have notified the bomb squad first, but, hey, that's just me. Divers found several more explosives when conducting a search of the river. Bomb response supervisor Sgt. Jodie Pearson told InMyCommunity that this was the first time in her 12 years with the bomb squad that explosives had been reported found in the river. She said police believed the explosives were dumped illegally, which begs this question: Could explosives ever be dumped legally? Nobody knew where they had come from. "The most likely thing is that someone just wanted to get rid of it and dumped them in the river," Pearson said. Or somebody was fishing with dynamite, albeit unsuccessfully, which would sort of ruin all dynamite-fishing jokes in the future. The above photo of a fisherman in Vietnam kinda already proves it's not a joke. It also implies it's not necessary to care for each solid to be sure your darn thing went down right! A lot of people relate your rods having really feel. Nevertheless, perhaps you have received a new cope with that could hang up the phone or perhaps get rigid parts within it as you cranked your attract inside, for more information visit here. The once ubiquitous handline, centrepin reel or 'snapper winch' has given way to ... There is little doubt that a relatively short, fast taper rod in the jig stick mould is ... are a couple of 10 kg strokers that are absolute dynamite on really big reds. If you are one of them who loves fishing then before buying do some research so that your money don't get waste. To know more please visit.Best spinning reel!